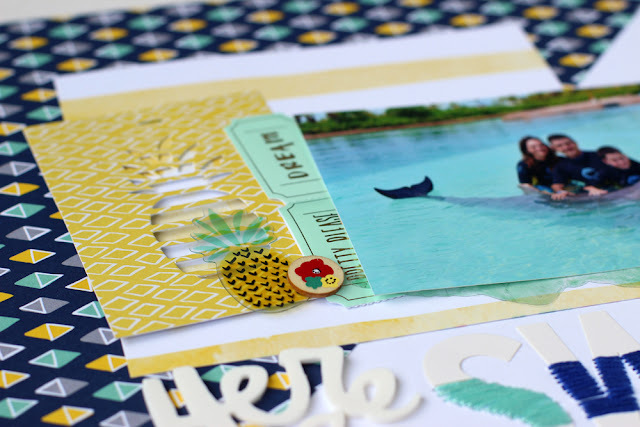 Hi there and welcome to the Cardmaker Magazine and Plus America blog hop! I love the idea of no fuss stamping and this little gadget delivers. This little self-inking roller stamp has 18 fun patterns to choose from and is the easiest way to get a continuous pattern in one swipe. 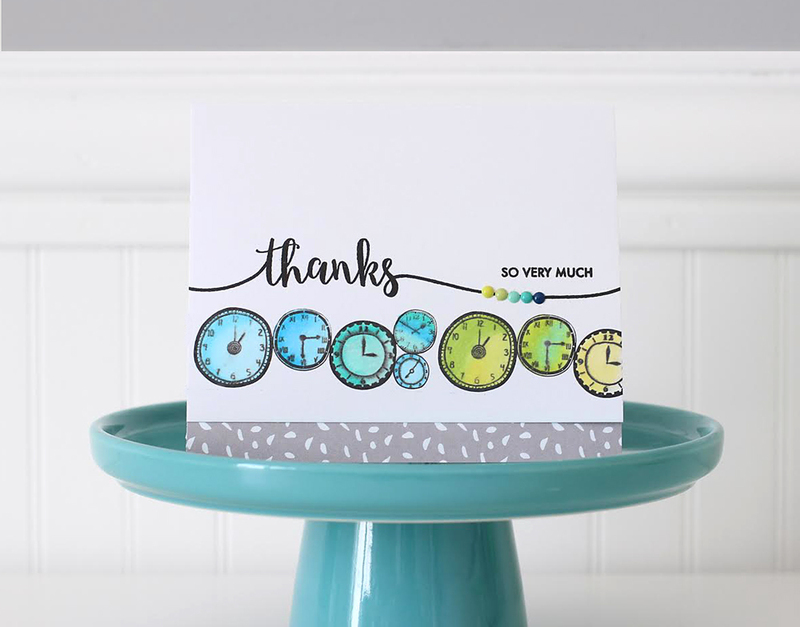 I created this card with the clock cartridge and experimented with some Zig Clean Color Markers. for a pretty watercolor effect. I limited the colors to greens and blues blending them together across the card. The ink held up pretty well considering how many times I went over it with the watercolor markers. While I like the crisp image straight out of the roller, I like the dreamy effect the watercolor markers added even more. Plus America is doing a big giveaway on their Facebook page, so take a look and enter to win! Now hop on over to Daniela Dobson's blog for another great PLUS America project. If you get lost along the way, please see the Carmaker Magazine blog for a complete list of designers participating today. Stitching is a design element that I keep going back to again and again. There's nothing like a little needle and thread work to add a pop of color and texture to a story. I made this a while back for the American Crafts blog using Amy Tangerine's Finder's Keepers collection. 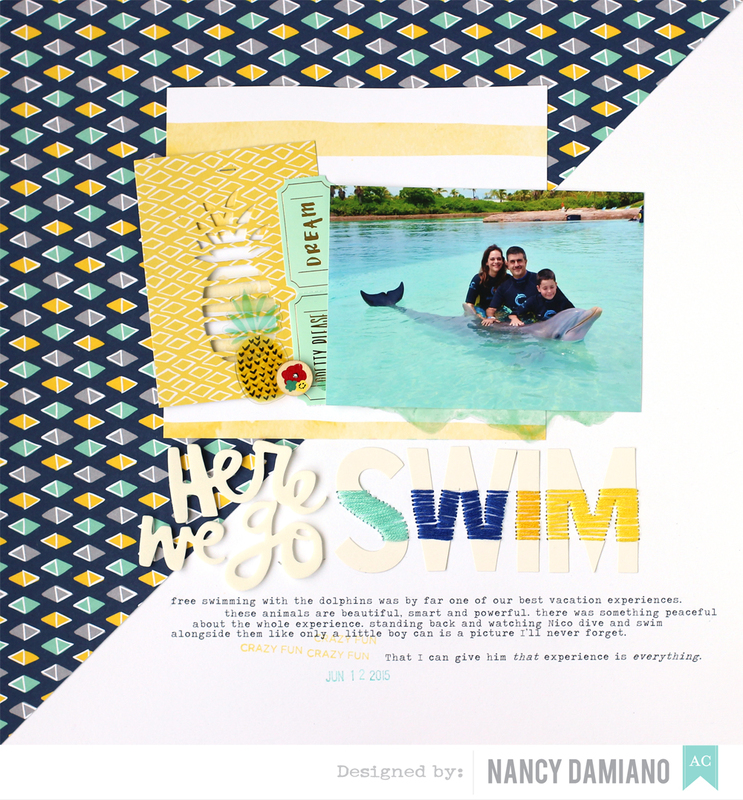 I wanted to highlight this story about swimming with the dolphins in Atlantis, keeping the design bold but not so bold that it would eat the photo! To see how I created the title, see the blog post here. Basically, I cut the center out of the AC DIY Subway Alpha Stickers, stuck them down to the layout and then filled in the missing parts with embroidery floss. Instant pop and that handmade touch I like to add! This one took a bit of planning. I had to decide the spacing for the title, mark off exactly where the journaling would go and then run the background through my Epson wide format printer. To add weight to the photo, layers of die cut Finder Keepers paper were used. A few wood and transparency embellishments and a few tickets tucked just underneath add more color and weight to the focal point. The bold diagonal background does the same thing - draws the eye right to that photo smack in the center! Versatility - it's what I love about a good scrapbook collection. Good colors, a variety of icons that are just the right amount "themey" and a few good embellishments is what I found in Dear Lizzy's Happy Place Collection. Here are few things I've made with it lately. Layered cards for the season. The suede mini tassels are one of my favorite embellishments this season. And I've never met a gold paperclip flamingo I didn't love. Proof of how much I love texture and color. I wanted to create texture with a tropical feel. Rows and rows of pretty little squares frame out the photo and scream "Caribbean." Glitter dipped die cuts are a quick and easy way to give a card some pop factor. I cut the star with my Silhouette and popped it up with foam for dimension. 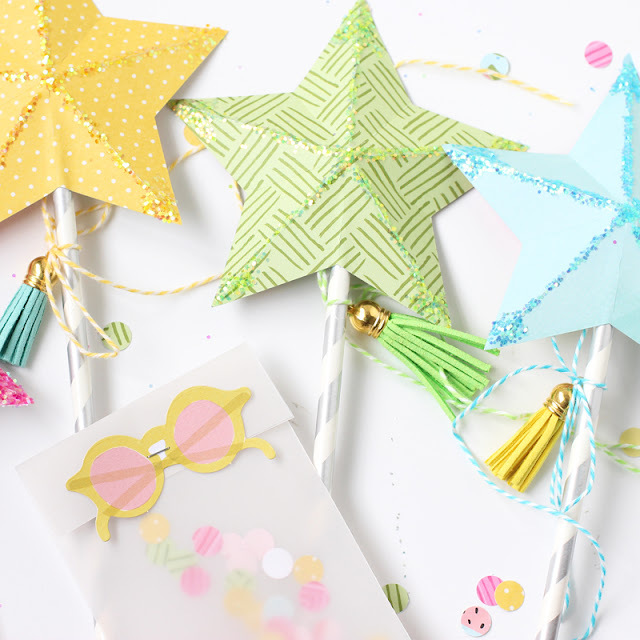 Who doesn't love a glittery wand and envelopes full of confetti? These were created for my niece's birthday party and they were a hit! 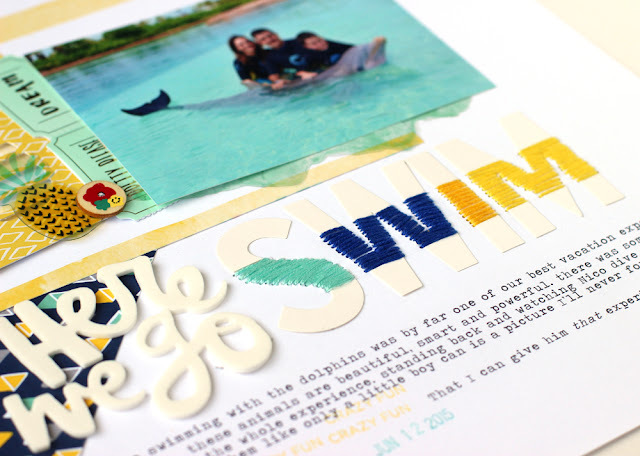 Lining up rows of the watercolored die cut titles from the collection are an easy way to create a bold layout. 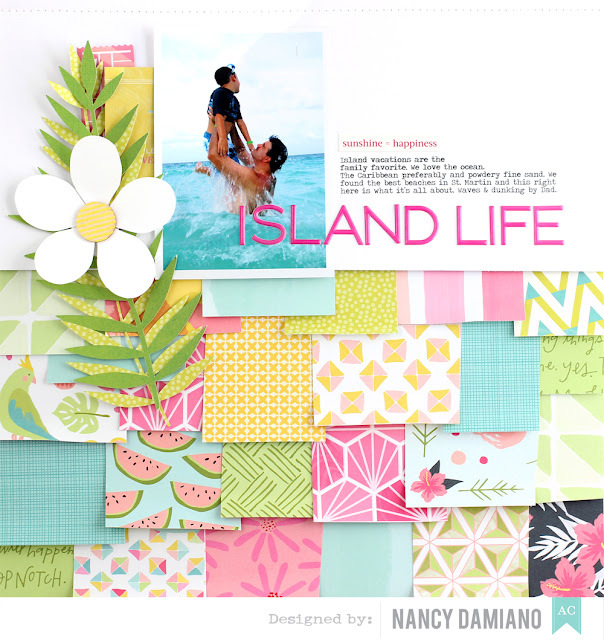 Layers of the pretty papers and die cuts add to the tropical feel of the photo and story. A departure from all the vacation layouts, here I used the Happy Collection to make an everyday page about the little people in my life and being a Mom. Using the same watercolored word die cut pack, I customized this one with a light pink color wash. I love that the pack of die cut words comes both pre-printed and plain on watercolor paper so that I can use it in a variety of ways!